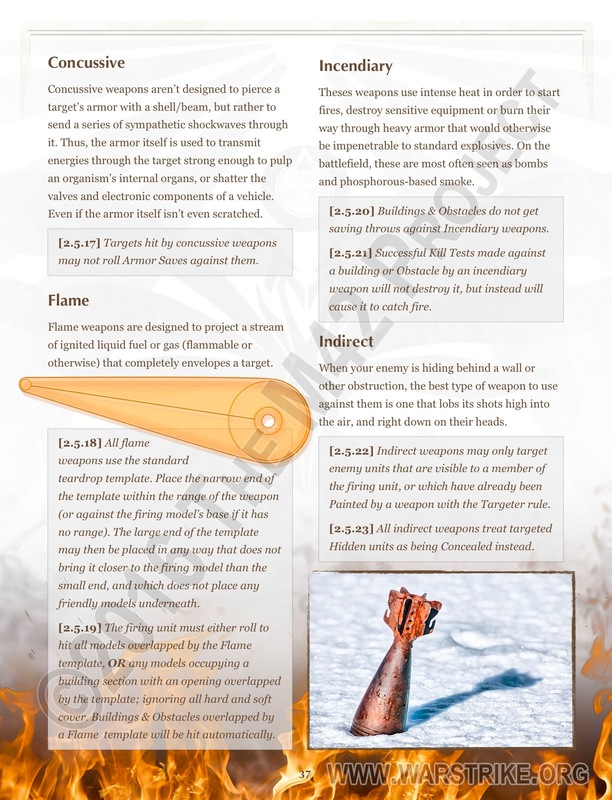 Here's the next page of the weapons section. I've also been busy (after finally getting an intro game) studying the Infinity rules for the first time. I'd avoided looking too closely at Infinity for a long time, but with our turn structure more or less done, I figured it was time to give it a look for interesting ideas that I could "Picasso" into our game. I did find a few interesting things, mostly on the hacking front. But given the vast differences in how the turn structures of the two games work, their difference in complexity/focus, and Infinity's penchant for coming up with completely new names for slightly different versions of the same rule, anything I end up incorporating into WarStrike will be almost unrecognizable in the final execution. Certainly there won't be hacking in the first full public release, though I'll be keeping it in mind as I design and tweak things. We were already planning Techno-Mage powers, and hacking would just end up being a sub-set of that. But hey, I can see why folks like Infinity now. While it's a bit complex and overly-wordy for my taste, it's a very well thought out design. If GW were to properly think-out and word the rules for 40K, this is how you'd do it. Though I think Infinity could simplify things vastly. The 24 hacking rules they have now could probably be boiled down to just 6-8 unique effects, for instance.